On the eleventh hour of the eleventh day of the eleventh month 1918, the guns stopped firing on the Western Front. It marked the end of World War I after four gruelling years of war. At 11am on the 11th November every year, Britain and indeed many parts of the world observe a two-minute silence to remember the men and women who sacrificed their lives for our freedom. It is a chance to reflect and pay tribute not only to those who died in the First and Second World War but casualties of all subsequent conflicts. Poppies grew in abundance around the war-torn fields of France and continue to be used to symbolise both remembrance and hope. 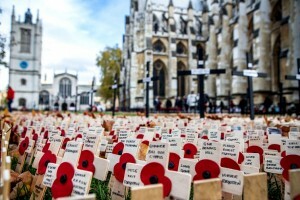 So where can you go to commemorate Remembrance Day this year? On Saturday 7th November the Royal British Legion will be hosting the annual Festival of Remembrance to commemorate the fallen. There is both a matinee and evening performance. The BBC will also broadcast the highlights of the evening. Headline acts include Rod Stewart, Andrea Bocelli and Pixie Lott, who will perform beside the Central Band of the Royal Air Force, the Band of HM Royal Marines, the Band and Pipes of the Brigade of Gurkhas and the Queen’s Colour Squadron. Thousands of poppies will be carefully placed in six Remembrance fields around the country to commemorate the members of our Armed Forces who’ve lost their lives since World War I. The Field of Remembrance in Westminster Abbey is officially open to all visitors between 9am and 4pm until the 15th November. Edinburgh and Inverness – Scotland. Join the nation in Remembrance and honour the two-minute silence as you stand amongst a sea of poppies, each paying tribute to a named soldier. The Royal British Legion will host the annual Remembrance Sunday event at the Cenotaph in Whitehall, London on the 8th November. It will involve a Service of Remembrance followed by a parade of leading dignitaries, serving members of the Armed Forces and veterans. If London is too far to travel, there are many churches and communities around the country that will be commemorating the event locally. On Armistice Day, join the Royal British Legion and listen to music and readings in Trafalgar Square before marking a two-minute silence at 11am. On Remembrance Sunday, a service will be held in front of the Armed Forces Memorial at the National Memorial Arboretum. There will also be an Armistice Day Service on the 11th November. Connected or a supporter of the military? We offer an alternative to conventional insurance for the serving, military families & supporters of the military. © 2019 The Military Mutual. © 2019 The Military Mutual. The Military Mutual Limited is a company registered in England and Wales with registered number 07147130 and registered office address at 54 Fenchurch Street, London, EC3M 3JY. For Home cover and Military Kit cover The Military Mutual Limited is an appointed representative of Regis Mutual Management Limited, who act as Lead Principal, a company registered in England and Wales (registered number 4194000) with its registered office at 7 Maltings Place, 169 Tower Bridge Road, London, SE1 3JB, which is authorised and regulated by the Financial Conduct Authority; FRN: 479202. For Commercial Combined and SME cover The Military Mutual is an appointed representative of MGA Managers Limited, which is authorised and regulated by the Financial Conduct Authority (FCA) under FCA Ref: 771791. You can check their registrations on the Financial Services Register by visiting the FCA’s website https://register.fca.org.uk/. Website Designed and Built by Bird Marketing. As an added benefit of membership, members of the Mutual who have bought the Mutual’s discretionary cover can have protection under a group insurance policy which the Mutual has taken out with Builders Direct S.A., a European insurance company (the Group Insurance Policy). The Group Insurance Policy also gives You access to the Financial Ombudsman Service (FOS) and the Financial Services Compensation Scheme. The protection You can receive under the Group Insurance Policy guarantuees that You will be paid for a covered loss in the event that We do not pay You in full under the discretionary cover. This Group Insurance Policy is quite separate from Your discretionary cover under the Cover with the Mutual. Builders Direct S.A. do not make any charge to You for the Group Insurance Policy. Insurance Policy at any time. Please refer to the “Opting Out” section below. If You are insured by Builders Direct S.A. under the Group Insurance Policy We have arranged for Our members, You can ask to be removed from the policy at any time. However, as this important additional protection is provided to the members free of charge, We strongly encourage You to retain this important benefit of membership of the Mutual.